The sandwich chapter doesn’t exactly have recipes, more like suggestions. It does have some unusual combinations, or maybe just old fashioned ones. The blurb at the start of the chapter does say that given a touch of imagination and a deft hand, anyone can produce sandwiches that are not just a stopgap but something to savour and enjoy! Advice is given on the bread, butter and fillings, it even advises on how and when bread should be sliced! There’s not a single mention of cheese and pickle or ham and mustard, the filling suggestions are slightly more elaborate! So as it’s Friday I’ve picked one of the fancier ones. Remove the crusts from the bread. Place an asparagus spear and a cooked chipolata, slice of ham or smoked salmon on each piece of bread and roll it up Swiss roll style. I just poached the asparagus slightly as per the packet, 4-5 minutes and I opted for chipolatas. I didn’t butter the bread, it does say for most of the other sandwiches to butter the bread so I had to assume the omission of the butter was intentional. I was tempted to add a bit of mayo or mustard but stuck to it exactly as it’s written. The start of the chapter also talks about the optimal time to by slicing bread for sandwiches, and apparently it should be a day old. However for rolled sandwiches it advises using as fresh as possible bread. 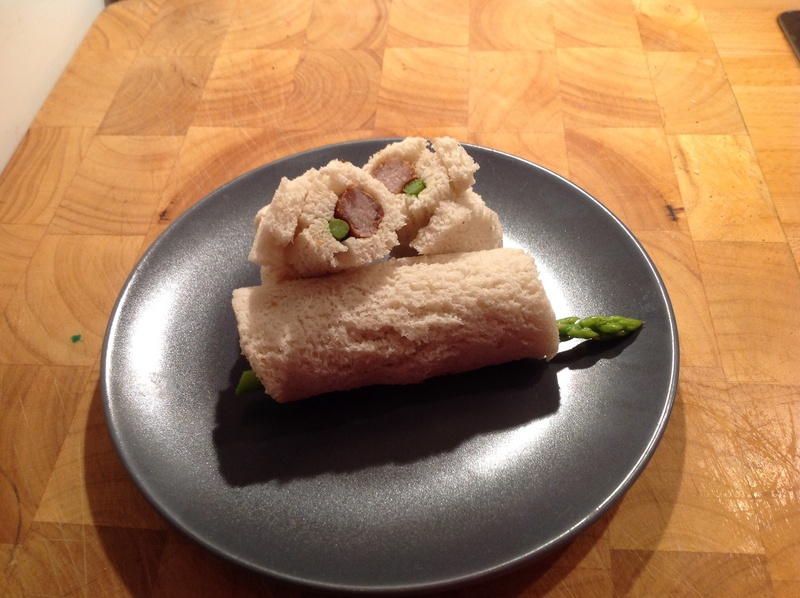 I had to assume that I was to wait until the asparagus and the sausage had cooled before I attempted to make the sandwich, otherwise I think it would’ve resulted in a soggy mess! I don’t think my bread slices were big enough as it didn’t roll up particularly well as you can see from the slightly dodgy photo! This was surprisingly tasty considering the simplicity. I think it would be even better with a sauce or butter. I had made an onion butter for the canapes with would’ve been nice with this, or just some mustard. I don’t think my bread was thin enough as I didn’t get a very good-looking swiss roll effect going on. If I was serving these at a tea party I would make sure it was thinner and trim the edges for a neater effect. Overall a nice change to the usual sandwich. Would I make this again? Yes, will try with salmon next time.